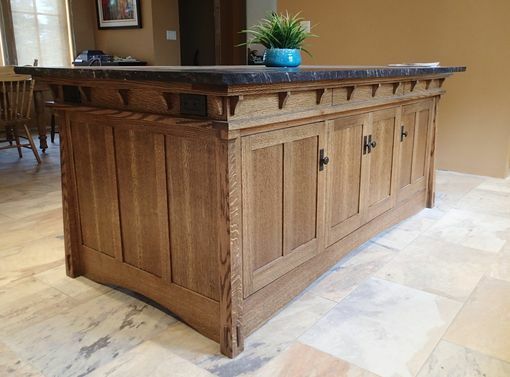 This Quarter sawn white oak Island is a focal point in a Mission style Kitchen . The wall cabinets are painted white with the same dentil crown moulding used at the top of the upper cabinets. Island Cabinets like this start at 12,000 The entire Kitchen comes in at approximately 40,000 Shipping of such products is extremely limited due to the size and weight of these cabinets. They do come apart but disassembly and reassemble is complicated at best. I hand deliver and install myself to assure a proper installation.